Last week in Part 8 we covered the layout of the new workshop and how storage is arranged. This week, I install the machines. Regular readers will know that the new workshop that has been built in this series is a replacement and upgrade for an existing workshop. That workshop, positioned under my elevated house, has been progressively equipped over the last eight years. Access to that area is down a very steep driveway, and over time a lathe, mill, bandsaw and other machinery have been moved down it. So how were those machines moved? In most cases, the machines were transported to the door of the workshop (except there aren’t any doors!) in a 6x4 trailer, lifted off the trailer with a hydraulic engine crane, and then moved to the right spot with the same crane. This pic shows the vertical mill being lifted into place with the engine crane. The only exception to this was when I purchased a sheet metal folding brake. The machine was bought sight-unseen on eBay, and when I went to pick it up, it proved to be much larger than the pic suggested! It weighs, I estimate, something like 750kg. I was able to (just) get it home on the trailer, the seller having available a forklift that could lift the bender into the trailer. 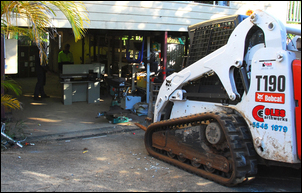 At home, I used a neighbour with a bobcat to lift the bender off the trailer and move it down the steep driveway. But there disaster struck, with the top-heavy bender toppling over, hitting the ground with a tremendous thud. Despite the impact, it was undamaged. The neighbour departed, and I then spent a full a full day pulling the machine apart until it was reduced to component pieces that I could just move with the engine crane. The bender components were then re-assembled in the designated location – and then the bender never moved again! Despite having used a car and trailer to transport most of the machines to the old workshop, I couldn’t do the same to get them into the new workshop. Why? 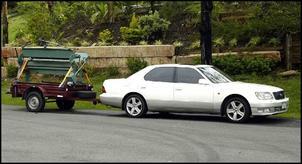 Because, the driveway is too steep to allow a car to pull a heavily-loaded trailer up it. Well, if I had a large automatic transmission all-wheel drive SUV, it could be done, but not with the cars I have. Furthermore, that approach would not work with the bender anyway – no car could pull that trailer load up the driveway. The bobcat neighbour has since moved, but I decided to take the earthmoving machinery approach again. I rang the contractor who had done the shed earthworks and he inspected my problem. 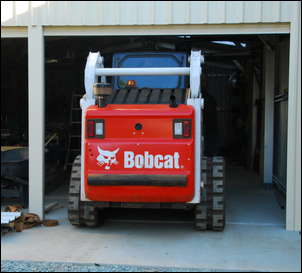 He thought the situation was tight for space, but suggested his bobcat equipped with rubber tracks would be able to do the job of moving the machines – even the bender. He said that the cost would be under AUD$200, and – interestingly - he’d need to use his best driver. In the event, he sent two workers to do the job. And, much to my astonishment, it all went smoothly – no dropped machines, no damage to the shed or the house. This is what some of it looked like. As can be seen, clearances for the bobcat were tight. Here is the under-house workshop area, with the machines lined-up to be moved. 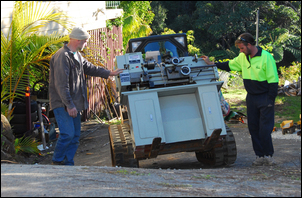 Carrying the lathe up the steep driveway. The bobcat has been equipped with removable forks. 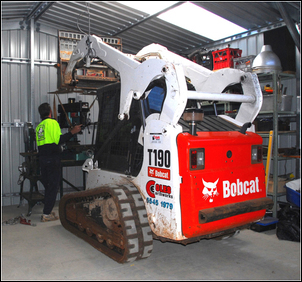 The new workshop doorway had only just sufficient vertical clearance (2.1 metres) for the bobcat to enter. In fact, the bobcat’s flashing roof-top light needed to be removed. 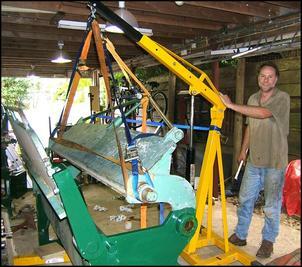 The bobcat was able to position the machines correctly: here the vertical mill is being lifted onto its bench. Carrying the big one - the metal folder! With an excellent driver, very good assistant and careful work, the bobcat achieved the task of moving this very heavy and awkwardly-shaped piece of equipment with ease. The folder had to be placed in exactly the required position – it’s too heavy to move afterwards! The driver was capable of such precision that after it was placed in approximately the correct location, the forks could be used to push one end (then the other), 10mm at a time. 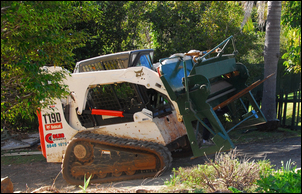 Note the tiny clearance behind the bobcat – this tracked machine can pivot on the spot. 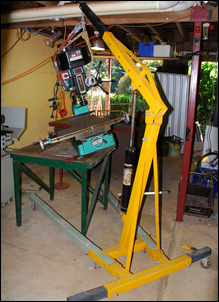 So after about 1½ hours of work, the lathe, mill, bender, workbench and table saw were all in place. Now, what about setting them up correctly? Machines with accurately ground ways like lathes and vertical mills should be carefully set up, primarily so that there is no twisting of these ways. Apart from machining test pieces and then measuring, the only way of achieving this is to use an engineering quality bubble level. These levels are much like normal levels except they are extraordinarily sensitive – for example, the bubble moving across the full viewing scale when just a normal sheet of paper is placed under one end! Bought new, these levels are very expensive but I bought mine secondhand on eBay for around $120. The aim with the level is not necessarily to get the machine level! Confused? Don’t be. Imagine the level placed across the machined ways of a lathe, at right-angles to the lathe’s longitudinal axis. The bubble of the level indicates perhaps that the lathe is not absolutely level in this direction. Note this bubble reading and then make the same measurement at the opposite end of the lathe bed. If the bubble shows a different level, the bed of the lathe is twisted. It’s in dialling out twist of this sort that the level is used. The first step is to use packing to ensure the machine tool isn’t able to be rocked or wobbled by hand. Then assess the twist in the lathe bed (or in the milling table) and counteract it by placing further packing under the points of the machine support that are low. It’s rather disconcerting to see how placing a very thin shim under (say) one leg of the stand of a lathe can result in a clear change in the twist of the bed! What looks immensely rigid and strong actually isn’t. 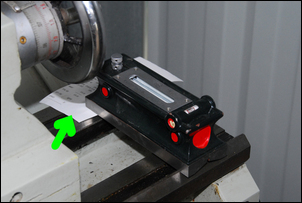 If the machine tool is not bolted to a stand, place the shims directly under the machine. 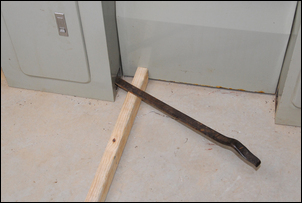 If the machine is bolted to a stand and shimming the stand does not correct the situation, consider placing the shims between the stand and the machine. I used a tyre lever and a block of wood to lift the corner under which the shim was to be placed. Shims can comprise steel or aluminium – if using the latter, make sure that the shim supports a large area. For the very thinnest shims, I ended up using wet and dry sandpaper – the thinnest material I had on hand that would be relatively stable. It’s easy to chase your tail and spend literally hours on this task, so rather than get everything dead-level, in the end I decided to quit when the machine was rigid and twists were negligible. 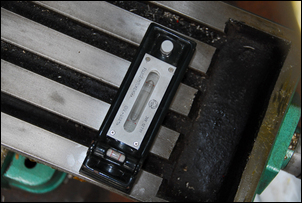 If the machine is not sufficiently level to bring the bubble of the level onto the scale, you can place a sheet of paper under one end of the level. The thinnest paper I found suitable for this was a cash register receipt (arrowed). Then when assessing twist, transfer the sheet with the level. Few people building a new workshop will be confronted with the problem of moving the machinery up a very steep drive way. 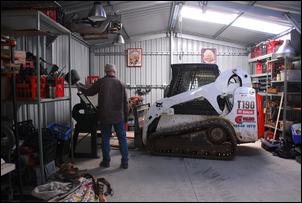 But if considering the purchase of heavy machinery, remember that the facility for moving it from a trailer or truck into a home workshop exists with a local earthmoving company. 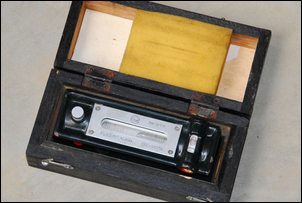 And keep an eye out for a secondhand precision engineering level – it’s an ideal instrument to be shared amongst a group of like-minded people. The observant will have noticed that the concrete floor of the new workshop has not been painted. I had initially intended doing so but after further thought, decided against it. The advantages of a painted floor are: it’s easier to clean up spills because the paint forms an impermeable layer; there is less concrete dust because the surface of the concrete is sealed; and the workshop looks better. Another possible advantage is that, depending on the colour, more light can be reflected under cars on which work is being carried out. However, I thought the disadvantages outweighed these: expensive (more than AUD$600 for an epoxy coating); the need to wait at least a few months for the concrete to properly cure; and the likelihood that the paint would need to be replaced periodically – even if that’s only every 5 years, it would still be an enormous effort (or do you just paint around machines, benches, storage shelves, etc?). So the floor remains as cast.